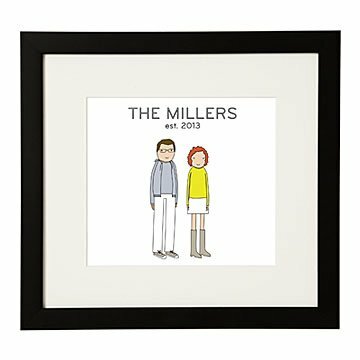 Showcase your favorite couple with Shelly Klein's whimsical personalized artwork. These quirky personalized prints featuring art by Mary and Shelly Klein, allow you to select characters, clothing, skin tones, and hair color to represent your favorite couple (and their pets!). Customize with the couple's name and the option of the year they were established as a duo. Printed on 100% archival enhanced matte paper and framed in black BonanzaWood®. Comes with hanging hardware. Made in Portland, Oregon. Check out our Personalized Family Print for a full family version. Check out the personalized family mugs. My friends LOVED this!! I was so pleased with the final product. They loved the outfit choices as well. Simply darling and very meaningful as a wedding gift. It is so appropriate for an anniversary gift. Was a 1st anniversary present! Loved it. So glad I found this great gift! It was so easy to order and it was created so quickly. A perfect gift! This picture perfectly depicts my husband and I with our black cat Howard. It not only looks like us, but is such an adorable picture to display. We absolutely love it. I bought this gift as a wedding day present for my future husband. It shows our little family in the perfect way. I was able to pick hair styles, colors and even the colors of our pets. Everyone who sees it loves it! I bought one for friends last year for their wedding. The bride cried when she opened it. So unique, so cute! Fun decoration for my daughter and boyfriend's new apartment, makes you smile! This was a wedding gift for a dear friend, and she couldn't be happier with the result. Great way to commemorate the beginning of a new family/life, and honor the start of a brand new family. The print came quickly, and the design approval process was seamless. Turnaround was pretty quick for a personalized piece, and took less than two weeks to order, approve the final design, and ship. The frame/matting is of sound quality, and at a good price. It's ready to hang and enjoy!